Green Driving is one of a handful of tactics companies can deploy in the battle against rising fuel costs. 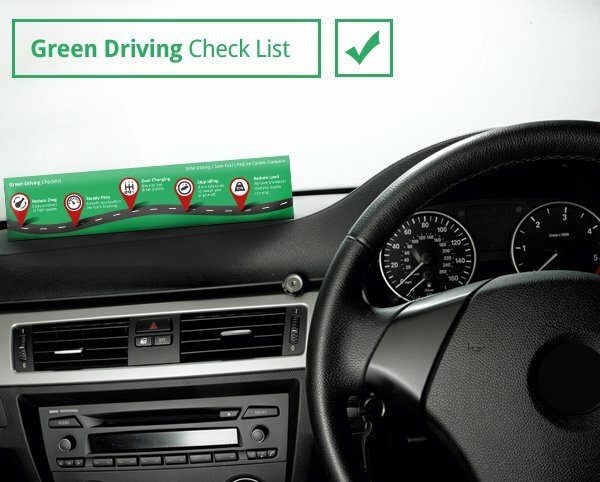 In this blog post we've collated some of the best green driving tips in a handy printable check list for you to download, print out and place on your vehicle's dashboard as a helpful reminder. You may or may not have heard of green driving; alternative names include eco driving or Fuel economy-maximizing behaviors, but it is arguably the simplest way to make significant savings in the running of your fleet. Below are five top green driving tips that we've drawn up into a easy to follow checklist. Simply click on the Tweet to active download button to download your copy. Having your windows open increases the drag on your vehicle, causing your vehicle to produce an additional 10% more carbon emissions. 2. Chill out on the air con. Not wanting to work you into a sweat or anything, but as well as keeping your windows closed we also suggest you lay off unnecessary air conditioning usage. Having your air con on can cut down your CO2 emissions by a further 5%, so if you're not melting, then this can be a really easy way to go green. If you can keep your vehicle moving by anticipating the flow of traffic ahead of you, it will allow you to keep off the breaks and acceleration pedals, which in turn should help decrease you CO2 and fuel consumption levels. Cruising around in 3rd gear is a no-no. Make sure you move into second and fourth gears as fast as you can to save even more. Changing up a gear at 2000rpm in a diesel vehicle and 2500rpm in a petrol can also make a big difference. For a quick win top up your tyre pressure and you'll be able to claw back 3% of your CO2 emissions. Nice and easy, wins the Eco driving race. Having a well planned out journey should stop you from rushing around! Aggressive driving can hike up your fuel usage by up to a 3rd. Taking your foot off the accelerator pedal as soon as you start to slow down or when driving downhill; while remaining in gear, will reduce the flow of fuel to the engine. Unnecessary idling is a really quick win. If you know you're going to be waiting around for a while, switch off your engine. Most modern vehicles use no extra fuel when restarted. Most modern vehicles have numerous electrical features from heated windows, seating, headlights, etc. Make sure if they are not a necessity, you turn them off. Not all vehicles come with cruise control but if you can put it into practice yourself and maintain a steady speed in as high a gear as possible, you will save a great deal of fuel. Around 45-50mph is the most efficient speed for most vehicles. Are you a boot hoarder? Ditch any unnecessary load from your vehicles and watch your fuel economy rise! A 100kg load can increase fuel consumption by upto 5 miles per gallon. Harsh braking causes fleet managers a double headache, not only does it increase fuel consumption but it will also wears down your brake pads and tyres, which all cost to be replaced! 13. Book in for a regular tune up. Poorly tuned engines can increase your vehicles fuel consumption by up to 50%. Make sure you check in regularly for a eco health check. If you have any green driving tips of your own, please do leave them in the comments below and we'll add them to our list above.